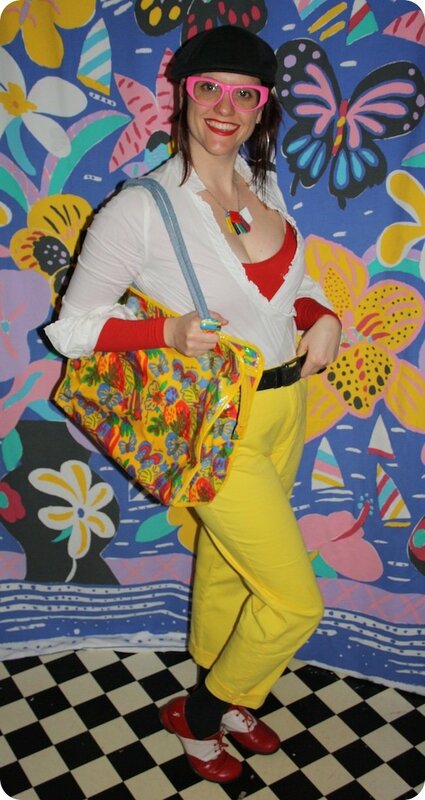 I'm not sure about you, but I often wonder how much yellow and red I can wear without looking like Ronald McDonald. I'll be buggered if I can't make two great colours fashionably work just because some huge corporation trademarked the 'look'. Because it's Friday, I've even gone further out on a limb and worn shoes that many people would argue are distinctly clown-like. Q. Ken it be Done? A. Yes, if you add the final *touch* of the bag! This whole outfit started with my Friday inspiration-Done-focus, which is a gift sent in from Glynis. 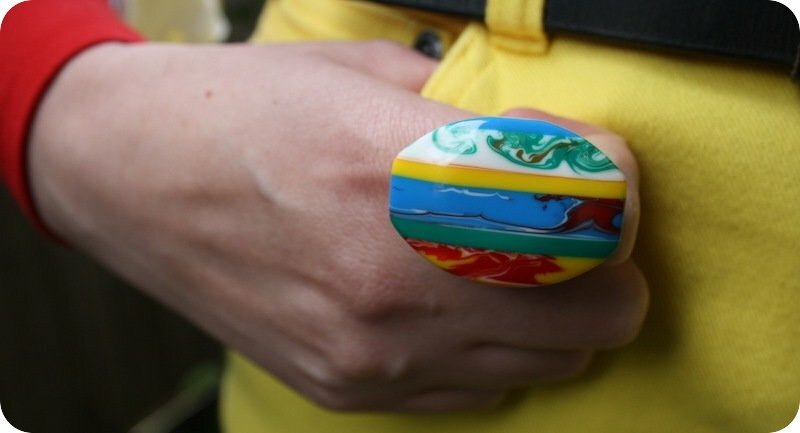 She donated this ring after seeing it in Melbourne and saying the colours reminded her of Ken Done. By pairing it with Kate's loaned Ken Done bag I think we can all agree just how spot on Glynis was. Thanks so much! And if all of this isn't enough to make your Friday *great*, then check out this recent video at Thelma on The Social Studio. C'mon and join the fun - make a donation today! Oh you cheeky bright thing you. Now, I have to ask my ma, but I have a Table Eight dress that I love but doesn't fit me anymore that I think will be just perfect for your challenge. It's a 12-14 but has shirring in the back and a halter neck so I never worried too much about the size until I shrunk and the gaps became a little too indecent. I couldn't part with it so gave it to my ma to store in the hope it would one day have a place in my wardrobe again. If she's hung on to it, it's yours. Oh and the glasses. $$$$$s indeed. Insane amount. I did think you were quick to have your lenses put in so fast. My optometrist is quick, but never that quick. Ohhh, they're so good. Wish I could stumble across a pair at the oppy. I wear Done scarves all the time and have some clangers in my collection. Have been hunting for the ultimate for my collection a Done vintage knit. Sigh, the op shops have never yielded me one yet. Go Glynis - the ring looks great. Do you hire yourself out for kids parties? Might make some additional $$ for TSS by doing so as a the surrogate Ronald McDonald - you do a very good impersonation in that outfit! Keep up the good work. I'll have the McJackie Happy Meal please. katiecrackernuts: fingers crossed your Mum keeps your clothing! The dress sounds *rad*. Anon: yeah, yeay for Glynis! And McDonalds jokes.. who would imagine that would happen?! Love it!